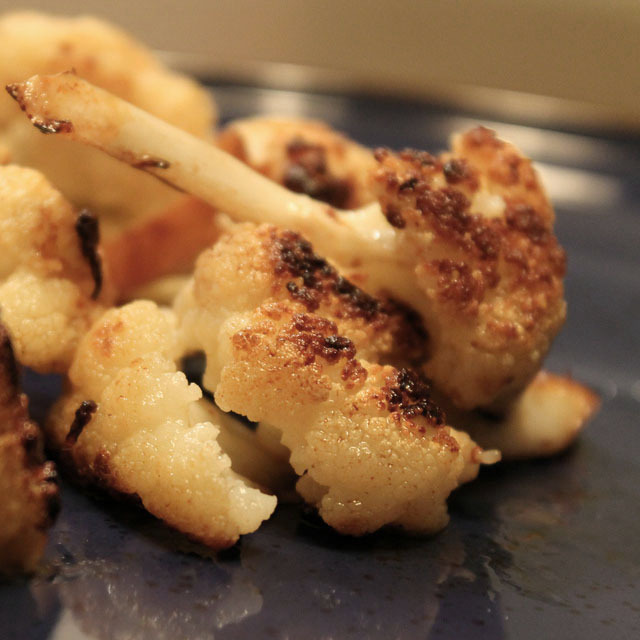 Pan seared Cauliflower is the perfect side-dish to any meal! Cauliflower are packed full of nutrients and taste absolutely DELICIOUS when cooked just right. Below I have outlined a simple method which we use here at the Spinning Cook household to make mouth-watering Pan-Seared Cauliflower – perfect for any occasion. Cut the cauliflower lengthwise into spears so the stem portions are no bigger around than your finger. In a wide heavy-bottomed pan or skillet, heat the oil over medium-high heat until it just begins to smoke. Add the cauliflower to the pan, carefully using tongs to avoid splatter. Reduce heat to medium, cover, and cook for exactly two minutes. Shake the pan to release the cauliflower, and flip over each piece using tongs so it doesn’t continue cooking on the same side. Carefully drizzle the soy sauce over the cauliflower and replace the cover. Cook for one more minute. Once again shake the pan, turn the spears with tongs, replace the lid, and cook for one additional minute. The cauliflower won’t be completely soft, but should be cooked through, and browned in places but not burned.